You can never replace the skills and expertise of a professional graphic designer ... but Canva comes pretty damn close. It's a ridiculously easy to use drag-and-drop design tool for both professionals and people like me who don't have the need (or knowledge required) to use more advanced graphic design software. 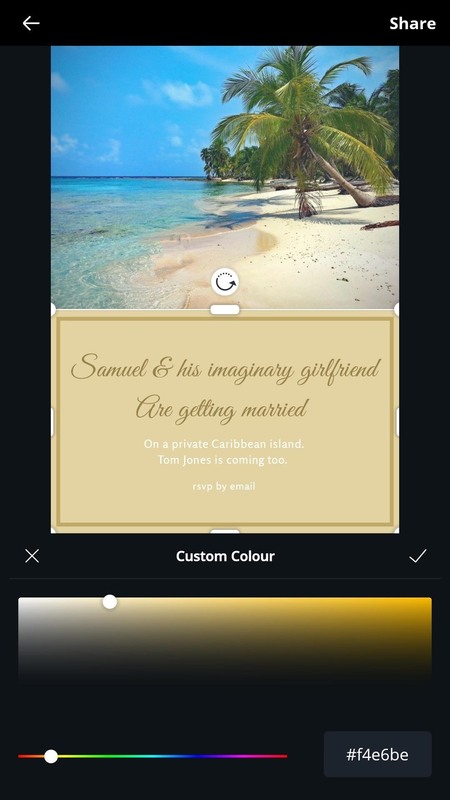 Canva originally launched as a website and recently released a fully featured mobile app for Android and iOS. Everything is created by dragging and dropping various elements which can be adjusted and customized to your liking, and with thousands of templates to choose from, you can create everything from posters and ads to YouTube thumbnails and social media covers, all from the palm of your hand. 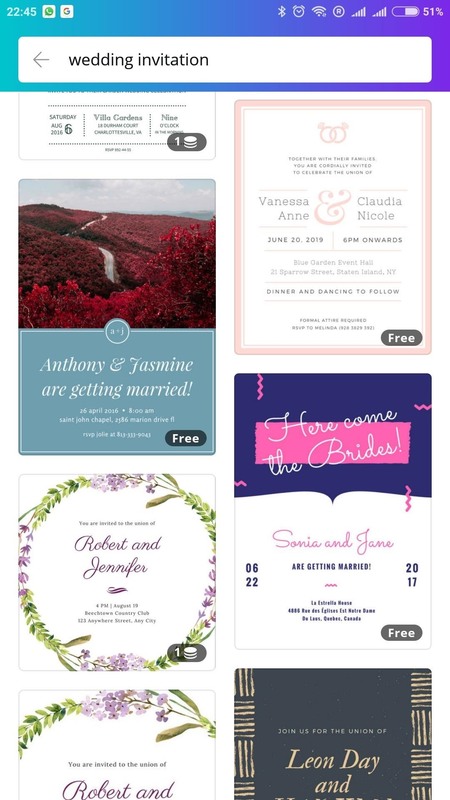 Some of Canva's most popular designs include posters, banner ads, Instagram posts, Pinterest posts, Twitter posts, infographics, wedding invitations, resumes, business cards, photo collages, and email headers. So it's a powerful tool, but it's actually really simple to use. Canva is free to use, though some features are reserved for the Canva for Work plan, which provides additional benefits, including unlimited storage, access to 400,000 image assets, custom dimensions, transparent designs, and priority support. You can test Canva for Work with a 30-day free trial, after which it's $12.95/month or $119.40 ($9.95/month) if you pay for the year up front. I've found that the free plan is more than enough for most design tasks, so that's the one I'll be using today. For the purposes of this guide, I'll be creating an imaginary wedding invitation. 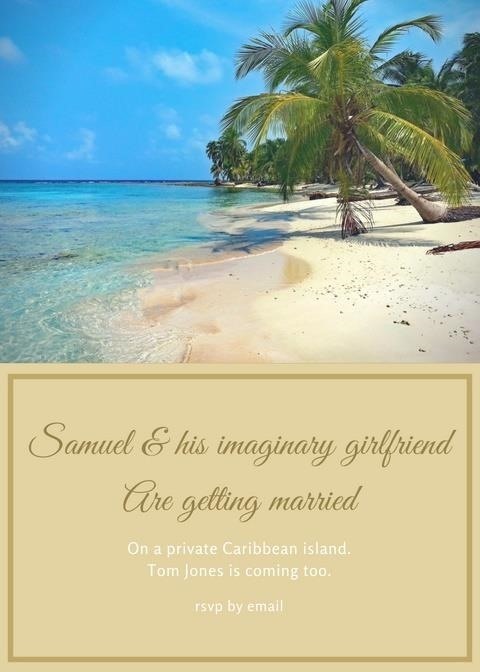 I've already created my imaginary wife and I've decided that we're going to get married on a private island in the Caribbean. There will be unlimited Rum and Jerk Chicken for all and Tom Jones will be dropping by to sing a few tunes at the end of the night. Before we start, you'll of course need to download the app. Check out the links below and let's get started. You can use the search box to find a specific template — my search for "Wedding Invitation" resulted in plenty of viable options, though Canva's drag-and-drop functionality is interchangeable, so feel free to search for something else. Once you've found the right template for your design, you can edit or add additional elements by tapping the + button. Individual elements are sorted by layers which are stacked upon one another. You can adjust the order and transparency by selecting an element and tapping the ellipsis menu button, reposition by dragging with your finger, and resize by dragging from one of the corner points. 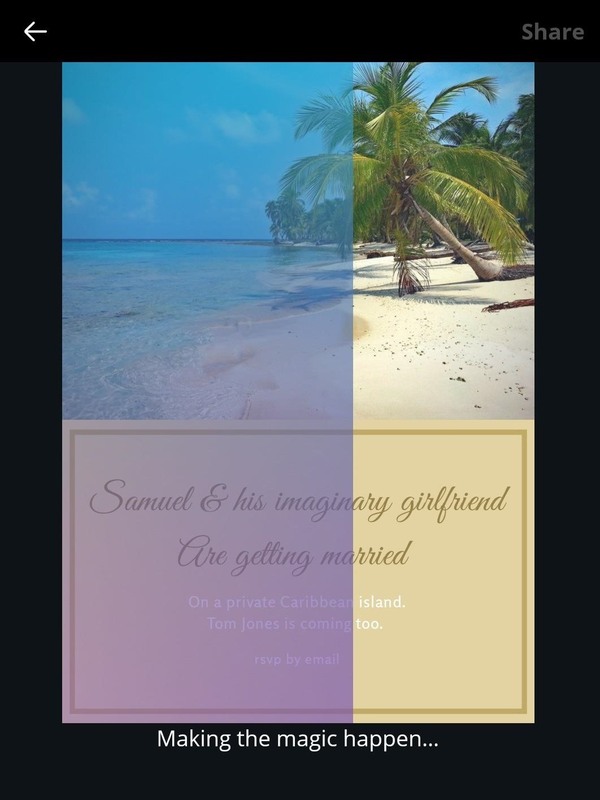 Below, you'll see the wedding invitation template I selected. It's nice and clean, with good space for imagery, but those trees aren't exactly suited to the whole Caribbean vibe I'm going for. Also, I'm neither Anthony nor Jasmine. Let's fix that. Thankfully, working with text couldn't be easier. With a single tap, you can edit and change the font size, type, and color. After adding my name and other relevant details, I changed the font and deleted the smaller circular element and text in the center of the design by selecting it and pressing trash icon. 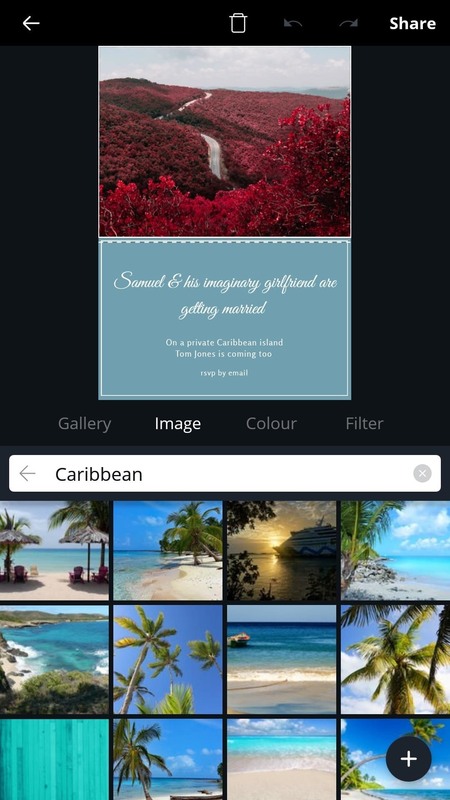 Gallery: Allows you to choose an image from your device or snap a picture on your phone's camera to be added to the design. Color: Choose a solid color as a backdrop. Filter: Apply custom filters and adjust image settings for the selected image. 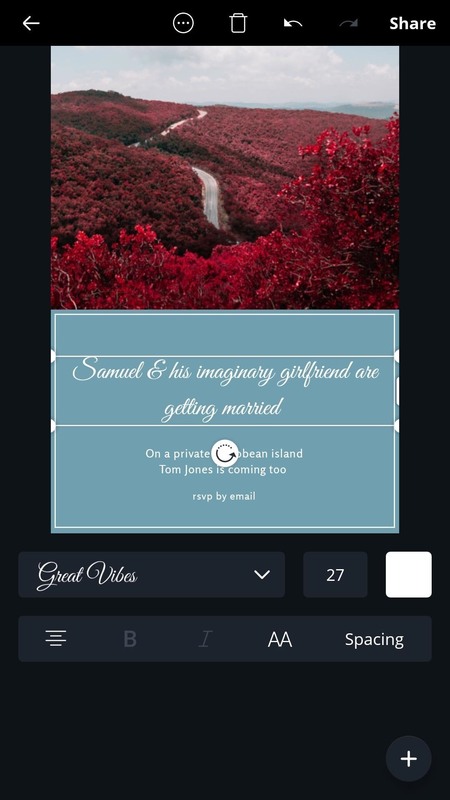 In this case, we'll select the Image tab to search through Canva's library for an appropriate picture. 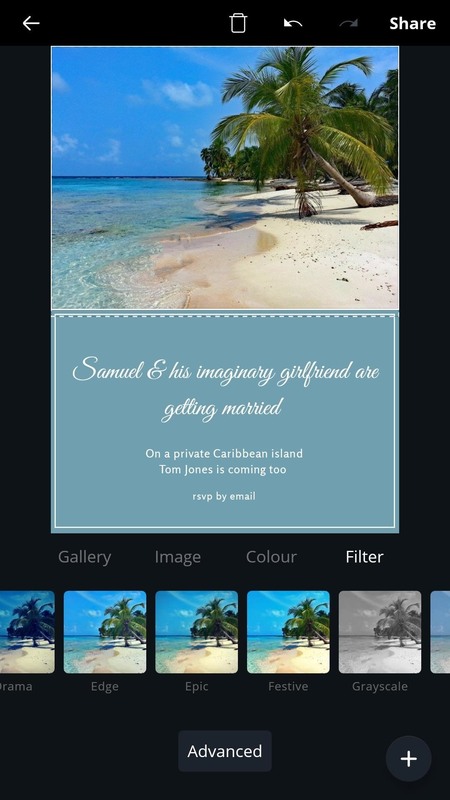 I found the perfect one for my invitation by searching for Caribbean. Once you've selected the best image for your design, you can pinch and drag to crop and apply a filter if you wish. 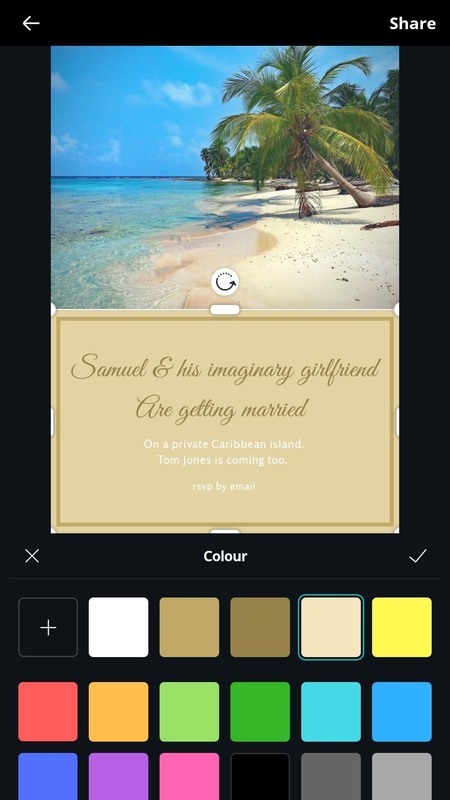 Customize your template's color palette by tapping an element and selecting the color box. I went for mainly gold and sand-like colors to compliment the picture of my tropical beach. Contrasting hues will help make important text stand out and you should try to use colors that are not only aesthetically pleasing, but fit well with the tone and purpose of your design. A pale blue, for example, will help to convey a more serene message, whereas an attention-grabbing red is more suited to stimulating designs that emphasize power. This Article from Creative Bloq offers some great tips for exploiting the use of color in your designs and how they can be used to elicit a unique emotional response in the viewer. With your colors set, the text in place, and everything else in order, your design is ready to be shared. Select the share button and you'll have the option to upload and send your completed design via your preferred application. All designs are automatically saved to Canva's cloud servers so you can always download or alter your work at a later date. Canva keeps things simple, but there are a few things to be aware of to ensure that your designs are as effective as possible. While there are no hard and fast rules, it's probably best to take to take a less is more approach when starting out. Keep things clean and simple, with easy to read fonts and a contrasting color scheme that's fits the tone you wish to convey, and always keep your target audience in mind. For example, if you're creating an ad, or a poster advertising a service or product, you'll want to think about choice of color palette and font, and how they can affect the viewer. 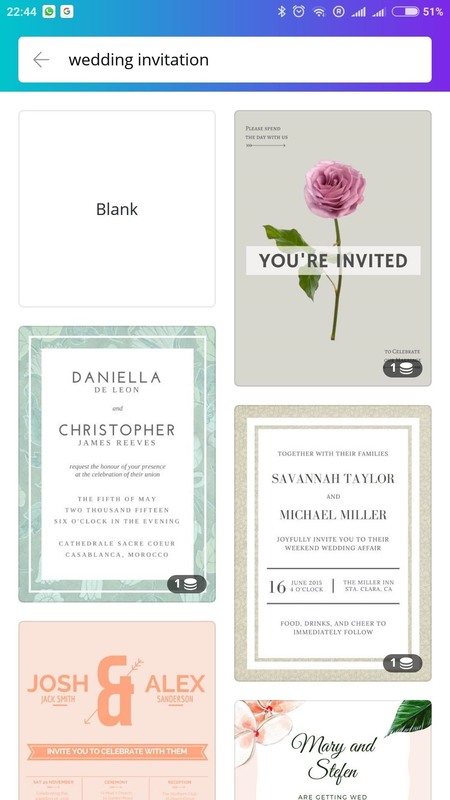 It's generally recommend to use no more than 3 different fonts, and while bold typography is great for standing out, it can read a little loud and intrusive – probably not the best fit for a wedding invitation! Canva's website provides a collection of learning tools and useful tips for creating all types of designs, including how to make amazing Facebook covers in 5 steps and this article offers some great design tips for non-designers.